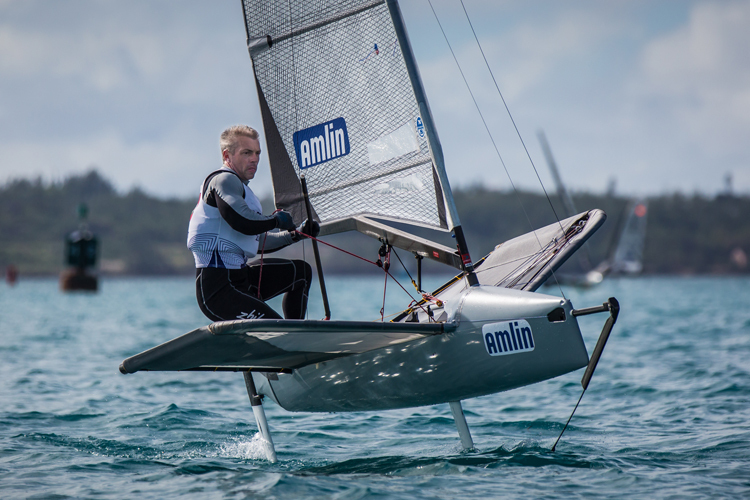 To no one’s surprise, a quartet of Britons set the pace today in the first day of the Amlin International Moth Regatta. Rob Greenhalgh (above), Paul Goodison, Chris Rashley and Chris Draper hold first through fourth, respectively, after the first three races of the regatta. Greenhalgh, the European champion, leads with 6 points, followed by Goodison with 7 points, Rashley with 9 points and Draper with 13 points. Greenhalgh and Rashley are class veterans while Goodison and Draper are from America’s Cup teams Artemis Racing and SoftBank Team Japan, respectively. The three races were held on Great Sound in mixed conditions. The first and third races were ideal, sailed in 10 to 12 knots of breeze, and the fleet was able to get on the hydrofoils and stay on them, which is the key to success in the class. The second race was started in winds around 10 knots but the breeze died out as the fleet approached the first windward mark during a light rain squall. In the light winds it was harder to get on the foils, especially for the heavier sailors, and some dropped from the leading pack. Amlin are keen to have a charity connection to the Regatta. The Andrew Simpson Sailing Foundation was chosen since its objective it to “inspire the next generation” by using sailing to improve the lives of young people across the world. During the entire Regatta, visiting sailors as well as RBYC members will be encouraged to support this initiative "to buy a beer (or round) for Bart". Signs will be placed at all bar locations at the Club as per the attached with each donation being worth $8.